A single fully populated station with two leaf wetness sensors, four soil moisture sensors, and four temperature probes or. Two partially populated stations, one with two leaf wetness sensors and two temperature probes, and the other with four soil moisture sensors and four temperature probes. Available in two models. Choose the model without sensors, and add only those you need to meet your requirements. Or choose the Complete Sol Moisture/Temperature Station and add one or two leaf wetness sensors as desired. Compatible with the 6470 Stainless Steel Temperature Probe with Two-Wire Termination. Add up to 2 sensors to a single Wireless Leaf and Soil Moisture / temperature Station. Includes 40ft (12m) cable. inside weather-resistant shelter. Expected battery life is six to nine months. To view the data, add a wireless Vantage Pro2 console/receiver, Weather Envoy or Envoy8X and WeatherLink. Includes hardware for mounting on fence post or pole. Mounting pole is not included. Download the data to your PC for all the same powerful charting, graphing, and analysis as our standard WeatherLink. With Extra User License Kits, you can even download the data independently to multiple PCs - ideal for schools, agriculture, scientific fieldwork, and remote locations. Connects a vantage Pro2 console, Vanatge Vue console or Weather Envoy to a ham radio with TNC modem for instant transmission of both your location and the local weather conditions via APRS. with user-defined growing season and 24-hour period. You'll get evapotranspiration, chilling requirement, leaf wetness hours, and soil temperature hours - all with user-entered thresholds and starting and ending dates. Plus growing degree-days and temperature-humidity hours (with user-entered names of crops, pests, or diseases) and crop water management (with irrigation values and user-entered K-factor profiles). For use with all WeatherLink models except Mac versions. Some reports require the use of optional sensors. line of sight. Typical range through walls under most conditions is 200ft to 400ft (60m-120m). AC-powered model includes power adaptor, Solar-powered model includes solar panel and lithium backup battery. with the station). Includes solar panel, regulator circuit, rechargebale battery and 20ft (6m) cable. Add up to 4 probes to a single Leaf and Soil Moisture/temperature Station. Includes 15ft (4.6m) direct-burial cable. Additional Rainfall Information: 15-minute, hourly, monthly, and yearly rainfall, and rainfall amounts for each of the last 24 storms. Additional Wind Speed Information: 10-minute average wind speed and dominant wind direction. In addition, with Vantage Vue, you get 2-minute average speed, high speed and direction in the last ten minutes. Apparent Temperature: Heat index, and with Vantage Pro2's optional solar radiation sensor, the temperature-humidity-sun-wind index. Vantage Pro2 optional Solar and UV Radiation Sensors: Greater awareness of the dangers of excessive exposure to the sun. For agricultural users: Evapotranspiration, leaf wetness, soil moisture, and soil temperature with Vantage Pro2 optional sensors. You'll see current weather conditions, including indoor and outdoor temperature and humidity, barometric pressure, wind speed and direction, dew point and rainfall. You'll also get weather forecast icons, moon phase, sunrise/sunset times, graphing of weather trends, alarms and more. Vantage Vue also boasts the innovative Weather Center button that displays additional data on weather variables for today and over the last 25 days. 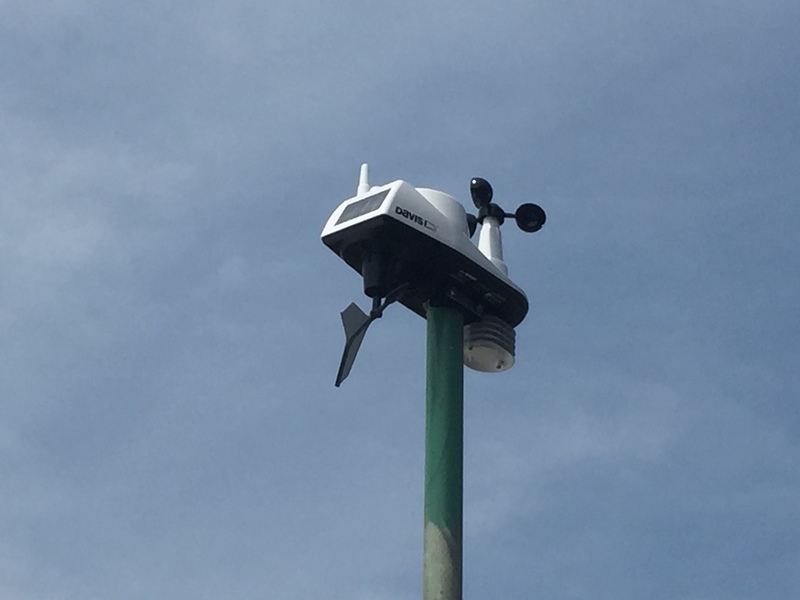 Vantage Vue includes a compact outdoor sensor array and an indoor LCD console. The fully-integrated, corrosion-proof sensor suite is built to take all the weather your location can give - freezing winters, springtime thunderstorms, blistering summer sun, and brisk autumn winds. The smaller profile sensor suite is designed to minimize visual impact in your yard or on your roof. The sensor suite transmits data wirelessly to the easy-to-read Vantage Vue console. With a range of up to 1,000 feet (300 m), Vantage Vue data packets are sent every 2.5 seconds to the console. Because Vantage Vue’s transmitters are radio-compatible with Vantage Pro2, you can mix and match components. For example, add a Vantage Vue console to your Vantage Pro2 system or extend your wireless range with long and short range repeaters. They all work together seamlessly. TIME & DATE -View the current time and date or time of sunrise/ sunset. MOON PHASE -See the eight phases of the moon. FORECAST - Icons let you know to expect sun, partly cloudy, clouds, rain, or snow. TEMPERATURE & HUMIDITY -Console updates outside temperature every 10 seconds and inside temperature every minute. In addition, outside humidity updates every 50 seconds and inside humidity every minute. VARIABLE DISPLAY OPTIONS - See updated values every 10 seconds for heat index and wind chill to get a better “feel” for the outside environment. WEATHER CENTRE - Weather Center provides additional information for each weather variable, such as daily highs and lows, temperature changes by the hour and barometric value changes. Also displays astronomical data such as meteor showers. USER-FRIENDLY KEYPAD - Domed buttons are easy to feel and press. Glow-in-the-dark keypad buttons give you access to weather information at night. The "Done" key returns user to “current” screen from anywhere in the program. GRAPHS - Graph the last 25 hours, days or months. View up to 50 graphs including temperature, rain, rain rate, wind and barometric pressure - all on the console. "THIS TIME YESTER DAY" FEATURE - Data point on the graph indicates the weather during the same time yesterday to help compare and analyze day-to-day weather trends. ALARMS - Set 22 simultaneous, different alarms to warn of dangers such as high winds, freezing temperatures, rain rate, heat index, flood warning, and more. WIND SPEED - See windspeed updates every 2 1/2 seconds. Displays windspeed in miles per hour, meters per second, kilometers per hour or knots. Provides the average and high wind speed for two-minute and ten-minute intervals. Two poles included measure 36.38" (0.92m) each, but can also be used together to makea single 69.75" (1.77m) pole. fits both the Vantage Pro2 and the Vantage Vue. Plus a diminishing collection of spare parts. 12 Hour Forecast Increasing clouds with little temperature change. Precipitation possible within 24 to 48 hours.